Well-rounded gravel, cobbles and boulders of quartzite have been transported over 1,000 km to the east of their Rocky Mountain source areas. They are found at the tops of mountains, ridges and plateaus, as well as at the bottom of valleys, and are found in deposits ranging in thickness from a thin veneer, or lag, to 5,000 m. Percussion and pressure solution marks are commonly found on the clasts. All of these evidences point to catastrophic, powerful erosion and transport on a subcontinental scale, suggesting that these deposits formed during the Flood. * Terms marked with an asterisk are defined in the Glossary at the end of this article. Figure 1. 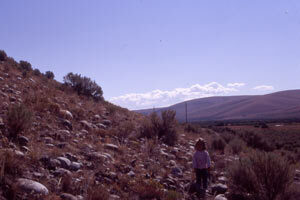 Quartzite sediment outcrop areas in northern and central Idaho and north-west Montana. Idaho batholith in west-central Idaho also indicated. Due to its hardness, quartzite weathers and erodes very slowly compared to the other geological materials (limestone, sandstone, shale and various metamorphic and igneous rocks) which make up the Rocky Mountains. 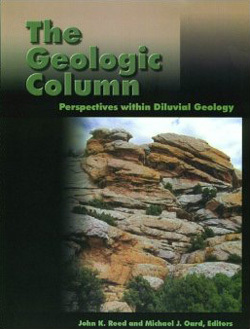 Consequently, well-preserved, transported, quartzite rocks are found in unlithified* deposits scattered eastward across the Northern Great Plains more than 1,000 km from their indicated sources (as will be discussed below).4 The clasts range from gravels to large boulders5 and are almost always rounded or well rounded, indicating water-borne transport.6 In this report we will use the term ‘gravel’ in a generic sense to include the larger cobbles and boulders. Poorly rounded clasts of the underlying rock strata are sometimes found mixed in with quartzite gravels suggesting that the processes that transported the quartzites also eroded and redeposited subjacent* rocks. For example, lozenged-shaped clasts of subjacent sandstones make up almost 5% of the clasts among the quartzites on the Cypress Hills of south-east Alberta. This paper describes the many occurrences and diverse circumstances in which well-rounded quartzites have been transported east of their Rocky Mountain source areas in the north-western United States. We will divide up the descriptions by areas, starting with the high plains of northern Montana and adjacent Canada. Next, we will briefly describe the high plains of southern and central Montana that we have not extensively explored. And finally we will discuss the quartzite gravels, as well as limestone conglomerates, in south-west Montana, north-west Wyoming and adjacent Idaho. A subsequent paper will document similar occurrences in Washington and Oregon west of the source outcrops. The data from these two areas consistently point to a catastrophic process that is not occurring today, which will be the subject of a third paper. Important evidence for catastrophic processes include the locations and properties of the quartzites, such as elevation, volume, percussion marks,* pressure solution marks* and iron staining (patina), which provide information on the mechanism of transport. In some cases, the estimated size of the gravel outcrop is only a rough approximation, because of our limited field work. Our maps of quartzite locations are, therefore, of a preliminary nature. Figure 2. Thick outcrop of bedded quartzite along Morgan Creek Road, about 7 km from Highway 93, 60 km south-west of Salmon Idaho and 15 km north of Challis, Idaho. Figure 3. Vitreous texture of a fractured quartzite boulder from the top of Red Mountain, northern Teton Mountains. Note the iron patina on the well-rounded surface of the clast (arrow). Quartzites are found among angular limestone clasts. 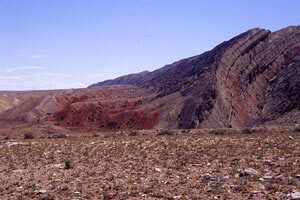 Red Mountain is composed of limestone. The Cypress Hills planation surface is the highest and is referred to as Bench Number Zero in Alden’s classification.12 The Flaxville plateau or planation surface in north-east Montana is referred to as ‘Bench Number 1’. The Wood Mountain quartzite gravels of southern Saskatchewan are at an intermediate altitude between the Cypress Hills and Flaxville levels. Bench Number 2 consists of many small plateaus lower in altitude than the Flaxville surface that are scattered about the high plains. The Fairfield Bench (about 140 km east–west) located north-west of Great Falls, Montana, is a typical example. The eastern part of this planation surface inspired William Morris Davis to construct his popular but now defunct ‘cycle of erosion’ or ‘geographical cycle’.13 Bench Number 3 is the lowest planation surface of all. In the Great Falls area, Bench Number 3 is a small gravel-capped bench along the southern portion of the Fairfield bench. It was from a gravel deposit on this bench that Klevberg14 deduced that rapid currents moving in excess of 15 m/sec deposited the gravel. Figure 4. Diagram of a gravel-capped planation surface on tilted sedimentary rocks that have truncated all lithologies the same amount whether hard or soft (drawn by Peter Klevberg and Daniel Lewis). About 50% of the clasts on top of the Cypress Hills have percussion marks, while only a few exhibit pressure solution marks. One exceptional boulder that we discovered had very large (4 cm radius) percussion marks (figure 9). Percussion marks on hard quartzite clasts imply very turbulent flow with some clasts hitting each other while briefly in suspension. The Swift Current Creek Plateau (south of Swift Current, Saskatchewan) about 70 km east-north-east of the Cypress Hills (see figure 5) is considered by some to be an extension of the Cypress Hills,19 as the quartzites capping this plateau are believed to be the same type as on the Cypress Hills (figure 10). This low-lying plateau is, surprisingly, only slightly glaciated with a thin cover of diamict,* being interpreted as glacial till, in some areas.20 This probably indicates that there was only one thin ice sheet during the Ice Age in this area. Figure 5. Locations of quartzite outcrops on the plains of northern Montana and adjacent Canada, east of the inferred source area located in the northern Rocky Mountains. Diamict, interpreted as glacial till, covers much of the area including most of the quartzite locations. Only the western cypress Hills and the Flaxville plateaus and adjacent Wood Mountain plateau are considered unglaciated. The Flaxville planation surface extends as a belt of large plateaus within an area 300 km east–west by 80 km north–south in north central and north-east Montana (figure 5).21 The plateaus generally rise 100 to 200 m above the surrounding plains. It is likely that these plateaus are actually erosional remnants and were once continuous as indicated by concordant surfaces and similar Cypflax on the plateaus. The quartzite gravel on the Flaxville surface varies in depth from about 1 m to as much as 30 m.
Quartzite gravel on top of the hills in Alberta is generally correlated to the Flaxville gravels.22 But this correlation is partially based on fossils.23 If the correlation is true, it indicates that the Flaxville gravel-capped planation surface was much more extensive in the north–south direction, and has been mostly eroded away, leaving behind erosional remnants. 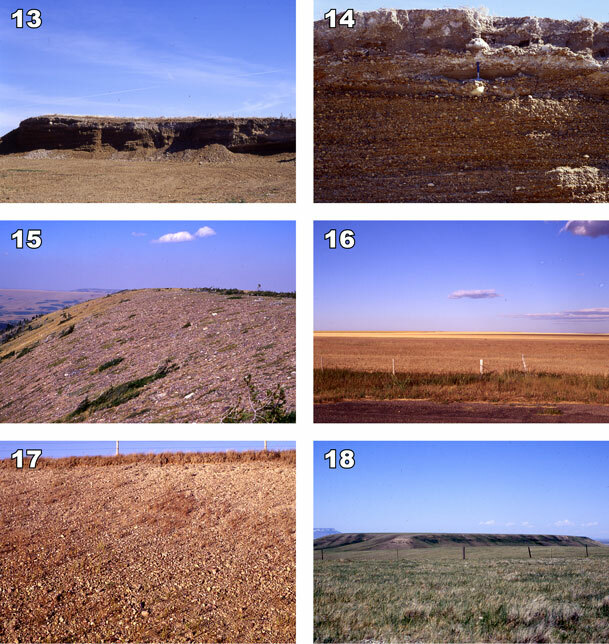 The best documented area of these gravel-capped hills are the Wintering Hills and the adjacent Hand Hills to the north (25 km east of Drumheller, Alberta), both of which are about 225 m above the surrounding plain (figure 11). About 9 m of quartzite gravel caps the Hand Hills.24 Many of the gravel clasts have an iron patina, while very few percussion marks were observed (figure 12). This gravel is similar to that on both the Cypress Hills and Flaxville Plateaus. Figure 6. The flat surface on top of the Cypress Hills at Upper Battle Creek. Surface has been partially dissected, likely from glacial meltwater rivers, since large crystalline boulders were found within the valley. Figure 7. View north over the edge of the central Cypress Hills at Conglomerate Cliffs. Figure 8. The quartzite gravel cap at Conglomerate Cliffs, central Cypress Hills. Figure 9. A boulder with percussion marks 4 cm in radius found in the western Cypress Hills, south-east Alberta (head of rock pick is 18 cm long). Figure 10. Gravel-capped Swift Current Creek Plateau at Lac Pelletier, Saskatchewan, Canada. Figure 11. Gravel cap on top of the Wintering Hills, about 25 km east of Drumheller, Alberta, Canada, approximately 225 m above the surrounding plains. Figure 12. Percussion marked and iron-stained boulder from the gravel cap on the Wintering Hills. There is no sign of glacial overrunning of the Wood Mountain uplands, as indicated by a lack of glacial features and the in situ gravel exposed at the top of the plateau. However, on a field trip to the area we found crystalline erratic boulders, likely from the Canadian Shield, lying on the surface of the highest terrain. These crystalline boulders are similar to those found extensively over glaciated parts of northern Montana, Alberta and Saskatchewan. Their existence on top of the ‘unglaciated’ Wood Mountain plateau suggests a different glaciological picture from the uniformitarian surmise for the area. These boulders were likely rafted into place in a pro-glacial lake that briefly covered this unglaciated area during deglaciation. Figure 13. In situ gravel cap on top of the Wood Mountain Plateau, south central Saskatchewan. This area is part of the driftless area during the Ice Age since there are no signs of glaciation and an ice sheet would have sheared off this gravel. Figure 14. Close up of the quartzite gravel in figure 13 showing the planar beds. Figure 15. Gravel-capped Two Medicine Ridge (erosion surface) just east of southern Glacier National Park. Part of the same erosion surface can be seen in the distance. Figure 16. Alden’s Number 2 Bench at the Del Bonita border station, north of Cut Bank, Montana. Notice the flatness of the planation surface. Figure 17. The gravel cap of the surface shown in figure 16. Figure 18. Gravel-capped planation surface remnant in the Judith Basin west of Lewistown, Montana. Square Butte igneous remnant, 600 m above the plains, is in left background. The combined Cypress Hills-Flaxville planation surfaces extend approximately 500 km from west to east. This implies almost 800 km transport for the quartzite to the eastern Flaxville plateau. If we include the isolated gravel locations in North Dakota, Cypflax Gravels have been transported at least 1,000 km from their nearest source area! Figure 19. Quartzite gravel locations in south-west Montana, north-west Wyoming and adjacent Idaho. Figure 20. Two distinct types of conglomerates about 15 km east of Lima, south-west Montana. The Red Butte conglomerate forms the side of the mountain, while the mounds in the foreground are quartzite gravel filling up the valley. Figure 21. Quartzite boulders from near locality in figure 20. Madison Wolfe, three-year-old granddaughter of lead author, for scale. There is a variety of surficial gravels on planation surfaces of the plains and locally on hills over Montana east of the continental divide. These gravels are south of the location of the Cypflax gravel and range from east of Glacier National Park south-east into south-eastern Montana. Much of the gravel is quartzite that is less metamorphosed than Cypflax and can be generally traced to the Rocky Mountains. Other lithologies from local mountain ranges are also found on planation surfaces. This latter gravel can be round to subangular and small to large in size. Just east of Waterton Lakes and Glacier National Parks, matrix-supported gravels are found on erosion surfaces that form foothills (figure 15). Called the Kennedy Drift, these gravels are up to 80 m thick with lithologies similar to in situ outcrops in the parks to the west. Uniformitarian geologists considered the gravels to be deposits made up of a number of glacials separated by interglacials and have dated them to around 2.5 Ma. The interglacial deductions are based mainly on so-called paleosols*. We have analyzed this gravel and found very poor evidence that it is glaciogenic,41 and we believe that the deduction that these ‘paleosols’ separate interglacials from glacials is unsupported by the evidence.42 About the only evidence for glaciation is striated* rocks, which can be formed by several different processes besides glaciation, such as landslides and other sediment gravity flows.43 There are a number of reasons why the deposit is likely a debris flow that moved east off Glacier and Waterton Lakes National Parks.41 The gravel becomes more rounded further to the east and by the time it is found north of Cut Bank, just south of the Del Bonita border station, it is well rounded and caps Alden’s Number 2 Bench (figures 16 and 17). The Fairfield Bench has already been mentioned. There are other gravel-capped benches that comprise Benches 1 and 2 north of the Fairfield Bench. The gravel, much of it quartzite, capping these benches can be traced to local lithologies in the Rocky Mountains around 50 km to the west. 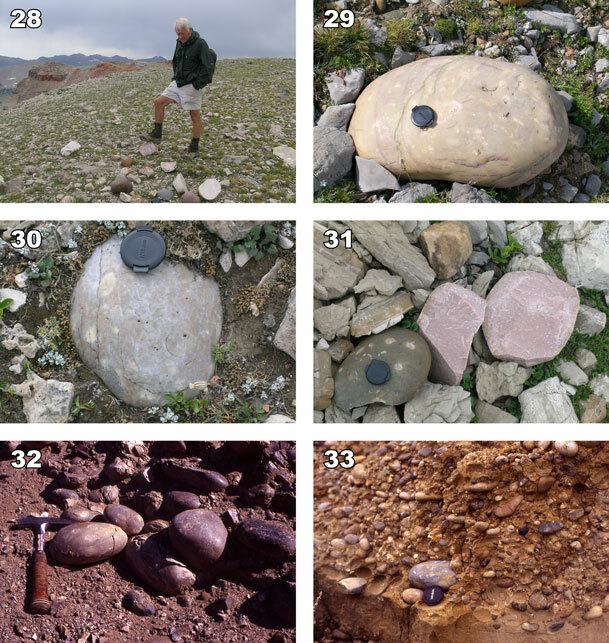 Several planation surfaces mark the topography of the Judith Basin in central Montana (figure 18). Most of the gravel capping these surfaces is local to the surrounding mountain ranges. Quartzite gravels are found on top of the Sheep Mountains west of Glendive in eastern Montana about 400 m above the Yellowstone River.44 This gravel, called the Rimroad Gravel by Howard,34 is fairly extensive on the hills north-west of the lower Yellowstone River and on a lower bench about 200 m above the river. Oard has also found quartzite lag gravel, some clasts that were iron stained and with percussion marks, along Highway 200S about 8 km west of Glendive. Quartzites are found in various locations elsewhere in southern Montana.9 Klevberg has observed high-grade quartzite cobbles and boulders with percussion marks in isolated deposits atop erosional remnants south of Billings, Montana. Figure 22. Sphinx Mountain, one of the highest mountains in the Madison Range, south-west Montana. Notice the horizontal bedding. Quartzites are found at many locations in the northern Basin and Range Physiographic Province (figure 19). This province is an area of crustal extension made up of horsts and grabens that have created high mountains and deep valleys or basins that are filled partially with ‘valley fill’ lithologies. The quartzites often are found at the surface, except where they fill paleovalleys. They are also found at the tops of some mountain ranges. There are generally two distinct types of gravel or conglomerate in south-west Montana and adjacent Idaho. One type is a limestone cobble-and boulder-conglomerate, or breccia, and the second type is predominantly well-rounded quartzite.45–48 The limestone conglomerate contains a minor proportion of other local lithologies. 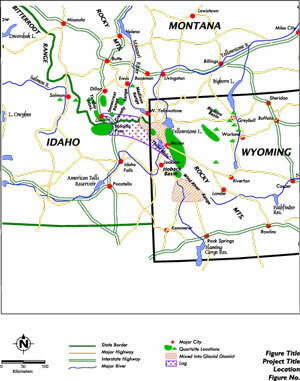 The limestone conglomerates are derived from the local ‘Paleozoic’ formations in south-west Montana and adjacent Idaho. They are red coloured because the limestone conglomerate often contains iron oxide in the matrix. The processes that eroded and deposited this conglomerate mostly occurred before the exotic quartzites from the west were transported into the area. For instance, on the top of the Gravelly Range, limestone conglomerate underlies quartzite gravel. Oard has observed the Red Butte conglomerate east of Lima that formed the sides of the mountains, while the quartzite was located in the bottom of the valley (figure 20). The clasts in the quartzite are usually large with percussion marks (figure 21). The limestone conglomerate is of interest because it sometimes forms entire mountains. More than 1,000 vertical metres of mostly limestone conglomerate forms Sphinx Mountain (3,442 m ASL) on top of the Madison Range (figure 22).52 There are gravel crossbeds up to 100 m thick on the north-east sided of the Sphinx,53 indicating rapid, catastrophic deposition. Paleocurrent directions are generally toward the north-east,52 indicating the material was transported across the current deep Madison Valley to the west before that valley formed. These conglomeratic mountains and the scattered locations of limestone conglomerate at lower elevations likely represent erosional remnants of a vast blanket of limestone conglomerate from local sources. The deposition of a thick sheet of limestone conglomerate with the transport of clasts up to 6 m long and the subsequent erosion of much of this conglomerate during tectonic uplift and sinking strongly indicates catastrophic action. Both the limestone and quartzite clasts can be quite large and in very thick deposits. Boulders up to 6 m long are found in McKnight Canyon north-west of Lima64 and south-east of Lima near the continental divide.65 Conglomerate in McKnight Canyon is around 2,900 m thick.66 The Divide quartzite conglomerate in Idaho south of Lima is estimated to be up to 4,750 m thick.67 We were unable to document this thickness and presume that the depth was determined by geophysical methods. A few of the quartzite clasts in the Divide Quartzite were almost a metre long with percussion marks and pressure solution marks. Figure 23. Red Conglomerate Peaks along the Montana-Idaho border west of Monida Pass. Notice the south-westerly dipping beds of red-coloured limestone conglomerate. Brent Carter, creationist geologist from Boise, Idaho, in foreground. Figure 24. Close-up of conglomerate in the Red Conglomerate Peaks. Notice that some clasts are rounded and some angular. Brent Carter provides the scale. Figure 25. Quartzite boulders from the Johnson Creek Valley, north-west Tendoy Mountains, south-west Montana. Figure 26. Large matrix-supported quartzites on top of the Gravelly Range, south-west Montana. Figure 27. Well-rounded quartzite boulder about 0.6 m in diameter from on top of the Gravelly Range, south-west Montana. The quartzites of south-west Montana and adjacent Idaho extend eastward into Wyoming in a semi-continuous belt. We found scattered surficial quartzites from near Interstate 15 in Idaho, just south of Monida Pass on the Idaho/Montana border, eastward to the northern Teton Mountains. These quartzites seem to have mostly formed a lag deposit on the surface or were reworked by local mountain glaciation. The north-western Teton Mountains contain in situ quartzite cobbles and boulders up to 635 m thick.68 The largest quartzite boulder observed in this area is 138 x 122 x 75 cm located 3 km west of Survey Peak. Several remnants of rounded quartzites extend south along the present northern crest of the Teton Mountains.69 Well-rounded quartzites have been found on top of Red Mountain in the northern Tetons, about 3,200 m high!69,70 Red Mountain and Mount Moran (3,829 m ASL) represent remnants of a flat-topped erosion surface in the northern Teton Mountains.71 The quartzites on top of Red Mountain were up to 50 cm long (figures 28 and 29). They had percussion marks (figure 30), pressure solution marks (figure 31) and were sometimes iron stained (figure 3). Quartzite is extensive in alluvial and glacial material in the low area from around Jackson Lake south to the city of Jackson, Wyoming.72 This material has been reworked from elsewhere. The most amazing quartzite gravel deposits are located east and north-east of Jackson, where thick deposits of quartzites make up 90% of the Harebell and Pinyon conglomerates.73,74 The Harebell Formation is believed to be stratigraphically lower than the Pinyon conglomerate, with the formations extending north into south-central Yellowstone Park to Mount Sheridan. 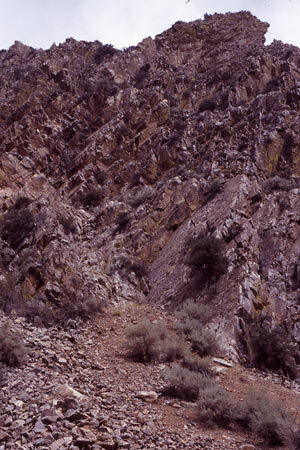 The quartzites in these two formations are identical to each other and to the Divide quartzite in Idaho. The estimated volume of the Harebell and Pinyon conglomerates is 300 km3 with a maximum thickness of about 3,300 m, making up whole mountains. Gold occurs in the finer-grained material between the quartzites. There are other outcrops of quartzite in north-western Wyoming. 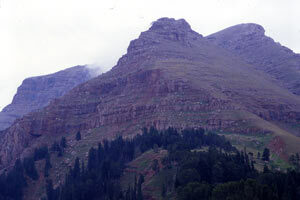 The Pass Peak Conglomerate is up to 1,060 m thick in the Hoback Basin, about 30 km south of the most southern outcrop of the Pinyon conglomerate.75,76 This conglomerate is very similar to the Pinyon Conglomerate in that the clasts are 90 to 100% quartzite, and the clasts are well-rounded, polished, fractured, contain gold in the matrix and are marked with percussion and pressure solution marks. The conglomerate is cross-bedded in places,75 just like the quartzite conglomerate that outcrops in the western Bighorn Basin. Dorr, Spearing and Steidtmann77 claim that the conglomerate was reworked from the Pinyon conglomerate, but Love disagrees because the clasts are too large (up to 40 cm along the long axis) and are unbroken contrary to what is expected since the Pinyon quartzite is well fractured. Figure 28. Quartzites from top of Red Mountains, northern Teton Mountains, mixed with angular limestone clasts. Split quartzites probably due to frost action along pre-existing fractures. Brent Carter provides the scale. Figure 29. Largest quartzite boulder, about 50 cm long, from on top of Red Mountain. Faint pressure solution mark just to the right of camera lens cap. Figure 30. Percussion marks on quartzite from on top of Red Mountains. Figure 31. Pressure solution marks on an iron-stained quartzite from on top of Red Mountain. Note texture of the typical quartzite to the right. Figure 32. Outcrop of quartzite gravel about 20 km east of Moran Junction. Note that the quartzites have pressure solution marks and percussion marks, and are polished and fractured. Figure 33. Quartzite gravel in south-west Bighorn Basin along Highway 431, 5 km east of Highway 120, north-central Wyoming. There is quartzite gravel within diamict, presumably glacially derived, that occurs on the surface of the northern Green River Basin around Pinedale. These quartzites likely were derived from the north, so were included in figure 5. There are also isolated outcrops of quartzite gravel in the western and southern Green River Basin and in Fossil Basin of south-west Wyoming. However, these will not be included in this survey because there are also possible sources of quartzites in the mountains of south-east Idaho and adjacent south-west Wyoming, as well as the Uinta Mountains of north-east Utah. Figure 34. Quartzite gravel on a pediment east of Sheep Mountain water gap, north-eastern Bighorn Basin, north-central Wyoming. Quartzite boulders are found among andesite conglomerate on top of Tatman Mountain, over 500 m above the valley, in the central Bighorn Basin.82 Kraus states that there are no quartzites in the eastern Bighorn Basin.83 She probably means there are no in situ quartzites. 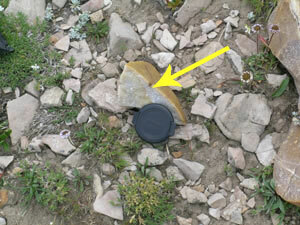 However, Oard has found quartzites at quite a few locations on pediments, terraces and bluffs in the eastern Bighorn Basin (figure 34). It is likely that some of this gravel, especially on river terraces, has been reworked by the river. The locations in the eastern Bighorn Basin represent a further eastward transport of about 50 km across the Bighorn Basin. 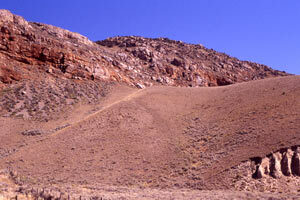 The total distance of travel from the west for the quartzite gravels in the eastern Bighorn Basin is 350 to 600 km! Three broad areas of surficial, quartzite gravel, which have been transported east of their apparent source areas in the northern Rocky Mountains have been investigated. The Cypflax quartzites spread more than 1,000 km across northern Montana, adjacent Alberta and Saskatchewan, and into north-western North Dakota. They are commonly iron stained with percussion marks and cap the Cypress Hills and Flaxville planation surfaces that are now plateaus high above the surrounding rivers. South of the area of Cypflax, quartzites are found on the Montana plains extending as far east as Glendive in eastern Montana. The clasts include many lithologies from local mountain ranges as well as Rocky Mountain source quartzites. In south-west Montana, north-west Wyoming and adjacent Idaho quartzite and limestone cobbles and boulders from the Rocky Mountains have been identified. The quartzites in this area are up to 1 m in diameter and are not only iron-stained with percussion marks, but also commonly dimpled with pressure solution marks and cut by fractures, indicating burial under significant pressure. These quartzites are found at numerous locations from valley floors to mountain tops, including the northern Teton Mountains. They have been spread as far east as the eastern Bighorn Basin, 350 to 600 km from their source. In a subsequent paper, we will document the spread of quartzite gravels west from their source, clear to the Pacific Ocean and in our final paper, we will delve into the uniformitarian hypotheses that attempt to account for all this long-distance transported quartzite. We conclude that the spread of quartzites is strong evidence for the Recessional Stage of the Genesis Flood in the north-west United States and adjacent Canada. The quartzites also provide additional insight into the phenomenal earth processes in operation at the time of Noah. We thank several people who have worked with us out in the field, including Ray Strom, Harold Coffin and Dennis Bokovoy. We thank Daniel Lewis for redrawing figure 4. Argillite slightly metamorphosed siltstone or shale. ASL above mean sea level. Chattermarks small, curved cracks commonly found in nested arrangements. Clast-supported individual gravel clasts touch each other, rather than being separated by a matrix of finer material. 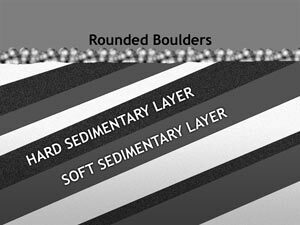 Diamict unconsolidated sediment made up of rocks of various sizes within a finer-grained matrix. Glaciation and landslides are two processes that can cause diamict. When consolidated it is called diamictite. Imbricated the flat surfaces of gravels, pebbles or grains are stacked with their flat surfaces dipping upstream. Massive homogeneous structure or texture. Paleosols old soil horizons usually buried by more recent geological layers. Patina surficial coating due to weathering, commonly comprised of iron oxide. Percussion marks circular to semicircular (conchoidal) cracks on the surface of rocks due to impacts. Poorly-sorted a wide-mixture of sizes. Pressure solution marks small circular cavities caused by the pressure of one clast against another, melting the rock at the contacts. Such features are caused by the pressure or weight from rocks or sediments above (see figure 28). Striated approximately parallel groves and scratches cut in a rock. Subjacent approximately adjacent in a geological context. Unlithified lithification is the conversion of unconsolidated sediments into a solid rock. Vitreous having a glassy texture. Colorado Plateau sandstones derived from the Appalachians? How does andesite lava originate in the earth? Orthoquartzite is an unmetamorphosed sandstone which is cemented by secondary silica. Most geologists do not use the term orthoquartzite but rather refer to these rocks as a quartz arenite. We will be concerned only with the distribution of metaquartzite, referring to this rock type simply as quartzite. Return to text. Bates, R.L. and Jackson, J.A. (Eds. ), Dictionary of Geological Terms, Third edition, Anchor Press/Doubleday, Garden City, NY, pp. 322–323, 1984. Return to text. Uniformitarian stratigraphic names are used for communication purposes only and are not meant to imply acceptance of the claimed ages or an absolute, but compressed, geological column and timescale. Return to text. Rounded igneous rocks are sometimes found with the quartzite gravels and may also have originated in the Rocky Mountains. Return to text. Sizes according to the Wentworth scale. Return to text. Abrasion by water is the only conceivable agent that rounds hard quartzites. Denudation, transport and deposition of quartzites may be by agents other than water, such as landsliding, glaciation, or mass flow. Return to text. Bates and Jackson, ref. 2., p. 170. Return to text. Oard, M.J., Pediment formed by the Flood: evidence for the Flood/post-Flood boundary in the Late Cenozoic, TJ 18(2):15–27, 2004. Return to text. Alden, W.C., Physiography and glacial geology of eastern MT and adjacent areas, U.S. Geological Survey Professional Paper 174, Washington, D.C., 1932. Return to text. Klevberg, P. and Oard, M.J., Paleohydrology of the Cypress Hills Formation and Flaxville gravel; in: Walsh, R.E. (Ed. 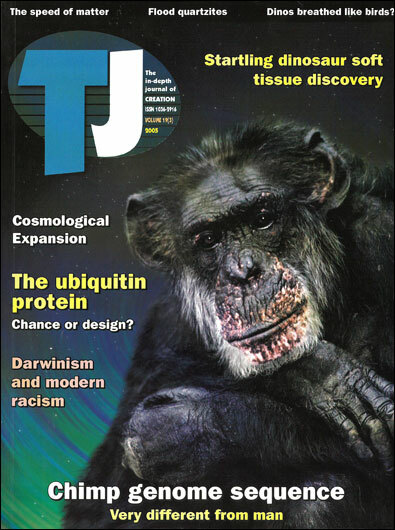 ), Proceedings of the 4th International Conference on Creationism, Creation Science Fellowship, Pittsburgh, PA, pp. 361–378, 1998. Return to text. Oard, M.J. and Klevberg, P., A diluvial interpretation of the Cypress Hills Formation, Flaxville gravel, and related deposits; in: Walsh, R.E. (Ed. ), Proceedings of the 4th International Conference on Creationism, Creation Science Fellowship, Pittsburgh, PA, pp. 421–436, 1998. Return to text. 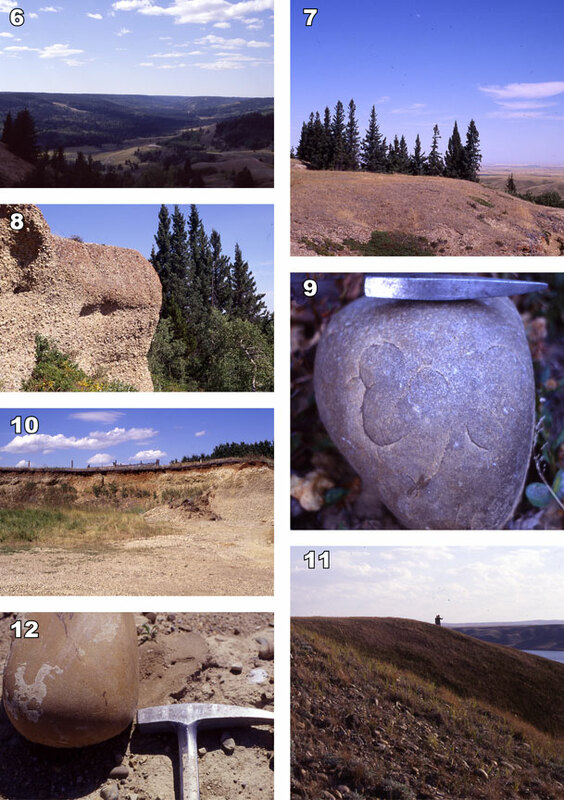 Vonhof, J.A., The Cypress Hills Formation and its reworked deposits in southwestern Saskatchewan; in, Alberta Society of Petroleum Geologists 15th Annual Field Conference Guidebook, Part I, pp. 142–161, Calgary, Alberta, Canada, 1965. Return to text. Crickmay, C.H., The Work of the River: A Critical Study of the Central Aspects of Geomorphology, American Elsevier Publishing Co., New York, p. 171, 1974. Return to text. Klevberg, P., The Big Sky Paving gravel deposit, Cascade County, Montana, CRSQ 34:225–235, 1998. Return to text. Oard and Klevberg, ref. 11, pp. 423–424. Return to text. Vonhof, ref. 12, p. 142. Return to text. Vonhof, ref. 12, pp. 158–160. Return to text. Leckie, D.A. and Cheel, R.J., The Cypress Hills Formation (upper Eocene to Miocene): a semi-arid braidplain deposit resulting from intrusive uplift, Canadian Journal of Earth Sciences 26:1918–1931, 1989. Return to text. Whitaker, S.H. and Vonhof, J.A., Upper Cretaceous and Tertiary stratigraphy of the Swift Current—Cypress Hills area; in, Simpson, F. (Ed. ), An Excursion Guide to the Geology of Saskatchewan, Saskatchewan Geological Society Special Publication No. 1, pp. 319–337, 1973. Return to text. Whitaker and Vonhof, ref. 19, p. 325. Return to text. Oard and and Klevberg, ref. 11, pp. 424–425. Return to text. Warren, P.S., The Flaxville plain in Alberta, Transactions of the Royal Canadian Institute 22(2):341–349, 1939. Return to text. Storer, J.E., An Upper Pliocene neohipparion from the Flaxville Gravels, northern Montana, Canadian Journal of Earth Sciences 6:791–794, 1969. Return to text. Williams, M.Y. and Dyer, W.S., Geology of Southern Alberta and Southwestern Saskatchewan, Canada Department of Mines Memoir 163, Ottawa, p. 98, 1930. Return to text. Sternberg, C.M., Miocene gravels in southern Saskatchewan, Proceedings and Transactions of the Royal Society of Canada 24(E–4):29–30, 1930. Return to text. 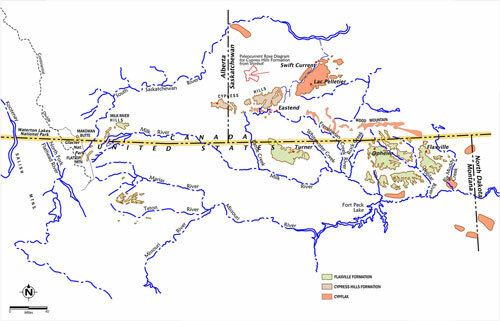 Klassen, R.W., Nature, origin, and age relationships of landscape complexes in Southwestern Saskatchewan, Géographie Physique et Quaternaire 46:361–388, 1992. Return to text. Storer, J.E., Tertiary mammals of Saskatchewan Part III: the Miocene fauna, Life Sciences Contributions, Royal Ontario Museum Number 103, Toronto, p. 2, 1975. Return to text. Oard, M.J., An Ice Age Caused by the Genesis Flood, Institute for Creation Research, El Cajon, CA, p. 147, 1990. Return to text. Klassen, ref. 26, p. 364. Return to text. Stalker, A. MacS., identification of Saskatchewan gravels and sands, Canadian Journal of Earth Sciences 5:155–163, 1968. Return to text. Whitaker, S.H. and Christiansen, E.A., The Empress Group in southern Saskatchewan, Canadian Journal of Earth Sciences 9:353–360, 1972. Return to text. Evans, D.J.A. 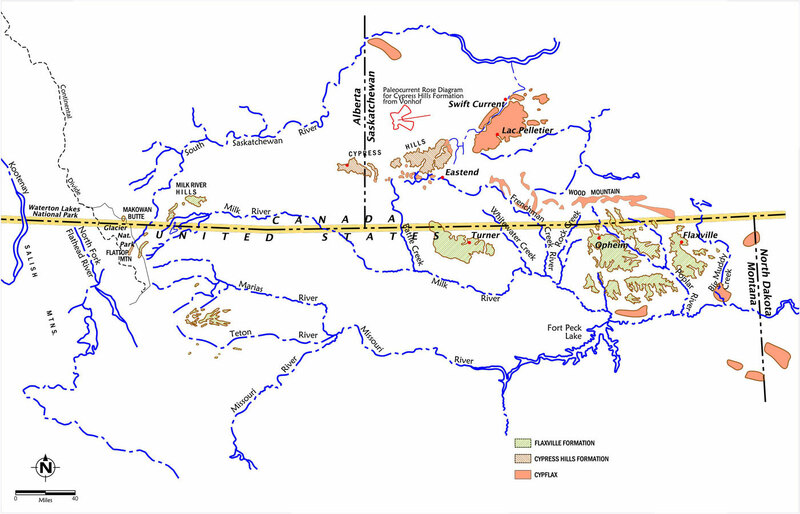 and Campbell, I.A., Quaternary stratigraphy of the buried valleys of the lower Red Deer River, Alberta, Journal of Quaternary Science 10(2):123–148, 1995. Return to text. Brown, R.W. and Pecora, W.T., Paleocene and Eocene strata in the Bearpaw Mountains, Montana, Science 109:487–489, 1949. Return to text. Howard, A.D., Cenozoic history of northeastern Montana and northwestern North Dakota with emphasis on the Pleistocene, U.S. Geological Survey Professional Paper 326, Washington, D.C., 1960. Return to text. Howard, A.D., Gott, G.B. and Lindvall, R.M., Late Wisconsin terminal moraine in northwestern North Dakota, Geological Society of America Bulletin 57:1204–1205, 1946. Return to text. Howard, ref 34, p. 16. Return to text. Alden, ref. 9, p. 8. Return to text. Howard, ref. 34, pp. 19–23. Return to text. Oard and Klevberg, ref. 11, pp. 427–428. Return to text. We have not investigated these gravels on a systematic basis, so this section will be brief. Return to text. Klevberg, P. and Oard, M.J., Drifting interpretations of the Kennedy gravel, CRSQ 41(4):289–315, 2005. Return to text. Klevberg, P., Bandy R. and Oard, M.J., Investigation of several alleged paleosols in the northern Rocky Mountains, CRSQ, 2005 (submitted). Return to text. Oard, M.J., Ancient Ice Ages or Gigantic Submarine Landslides? Creation Research Society Monograph No. 6, Creation Research Society, Chino Valley, AZ, 1997. Return to text. Alden, ref. 9, p. 12, plate 4. Return to text. Wilson, M.D., The stratigraphy and origin of the Beaverhead Group in the Lima area, Southwestern Montana, Northwestern University Ph.D. dissertation, 1967. Return to text. Ryder, R.T., The Beaverhead Formation: A Late Cretaceous-Paleocene syntectonic deposit in Southwestern Montana and East-Central Idaho, Pennsylvania State University Ph.D. dissertation, 1968. Return to text. Ryder, R.T. and Scholten, R., Syntectonic conglomerates in Southwestern Montana: their nature, origin, and tectonic significance, Geological Society of America Bulletin 84:773–796, 1973. Return to text. Ryder, R.T. and Scholten, R., Syntectonic conglomerates in Southwestern Montana: their nature, origin and tectonic significance (with an update); in: Peterson, J.A. (Ed. ), American Association of Petroleum Geologists Memoir 41, Tulsa, OK, pp. 131–157, 1986. Return to text. Lowell, W.R. and Klepper, M.R., Beaverhead Formation, a Laramide deposit in Beaverhead County, Montana, Geological Society of America Bulletin 64:236–244, 1953. Return to text. Nichols, D.J., Perry, Jr, W.J. and Haley, J.C., Reinterpretation of the palynology and age of Laramide syntectonic deposits, southwestern Montana, and revision of the Beaverhead Group, Geology 13:149–153, 1985. Return to text. Haley, J.C. and Perry, Jr, W.J., The Red butte conglomerate—a thrust-belt-derived conglomerate of the Beaverhead Group, Southwestern Montana, U.S. Geological Survey Bulletin 1945, U.S. Government Printing Office, Washington, D.C., 1991 Return to text. DeCelles, P.G. et al., Laramide thrust-generated alluvial-fan sedimentation, Sphinx conglomerate, Southwestern Montana, American Association of Petroleum Geologists Bulletin 71:135–155, 1987. Return to text. Beck, F.M., Geology of the Sphinx Mountain area, Madison and Gallatin Counties, Montana; in: Campau, D.E. and Anisgard, H.W. (Eds. ), Billings Geological Society 11th Annual Field Conference, 1960: West Yellowstone-Earthquake Area, University of Montana, MT, pp. 129–134. Return to text. Dyman, T.S., Haley, J.C. and Perry, Jr, W.J., Conglomerate facies and contact relationships of the Upper Cretaceous upper part of the Frontier Formation and lower part of the Beaverhead Group, Lima Peaks area, Southwest Montana and Southeast Idaho, U.S. Geological Survey Bulletin 2131, U.S. Government Printing Office, Washington, D.C., p. A8, 1995. Return to text. Lane, B.B., Hupp, B. and Waltall, B.H., First day geological road log: West Yellowstone to Lima Reservoir; in: Henderson, L.B. (Ed..), Montana Geological Society Guidebook: 18th Annual Field Conference August 9–12, 1967—Centennial Basin of Southwest Montana, Montana Geological Society, Billings, MT, p. v, 1967. Return to text. Mann, J.A., Geology of Part of the Gravelly Range, Montana, Princeton University Ph.D. dissertation, pp. 67–72, 1950. Return to text. 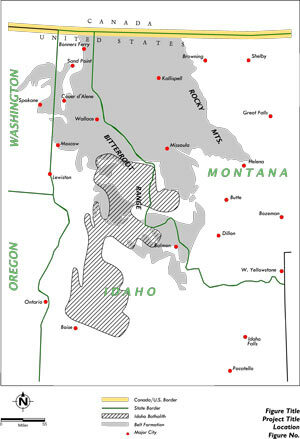 Mann, J.A., Geology of part of the Gravelly Range Montana, Yellowstone-Bighorn Research Project Contribution 190, Yellowstone-Bighorn Research Association, Red Lodge, MT, pp. 34–36, 1954. Return to text. Mann, ref. 57, p. 35. Return to text. Shelden, A.W., Cenozoic faults and related geomorphic features in the Madison Valley, Montana; in: Campau, D.E. and Anisgard H.W. (Eds. ), Billings Geological Society 11th Annual Field Conference, 1960: West Yellowstone-Earthquake Area, University of Montana, MT, p. 179. Return to text. Janecke, S.U., VanDenburg, C.J., Blankenau, J.J. and M’Gonigle, J.W., Long-distance longitudinal transport of gravel across the Cordilleran thrust belt of Montana and Idaho, Geology 28:439–442, 2000. Return to text. Mann, ref. 56, pp. 72–81. Return to text. Mann, ref. 57, pp. 37–41. Return to text. Oard, ref. 43, pp. 16–17. Return to text. Lowell and Klepper, ref. 49, p. 239. Return to text. Wilson, M.D., Upper Cretaceous-Paleocene synorogenic conglomerates of Southwestern Montana, American Association of Petroleum Geologists Bulletin 54, p. 1857, 1970. Return to text. Ryder and Scholten, ref. 47, p. 779. Return to text. Ryder and Scholten, ref. 47, p. 781. Return to text. Love, J.D., Harebell Formation (Upper Cretaceous) and Pinyon Conglomerate (Uppermost Cretaceous and Paleocene), Northwestern Wyoming, U.S. Geological Survey Professional Paper 734-A, U.S. Government Printing Office, Washington, D.C., p. A42, 1973. Return to text. Love, ref. 68, pp. A50–A51. Return to text. Blackwelder, E., Post-Cretaceous history of the mountains of central western Wyoming, Journal of Geology 23:208, 1915. Return to text. Blackwelder, ref. 70, pp. 193–217. Return to text. Lindsey, D.A., Sedimentary petrology and paleocurrents of the Harebell Formation, Pinyon Conglomerate, and Associated Coarse Clastic Deposits, Northwestern Wyoming, U.S. Geological Survey Professional Paper 734-B, U.S. Government Printing Office, Washington, D.C., p. B8, 1972. Return to text. Lindsey, ref. 72, pp. B1–B68. Return to text. Love, ref. 68, pp. A1–A54. Return to text. 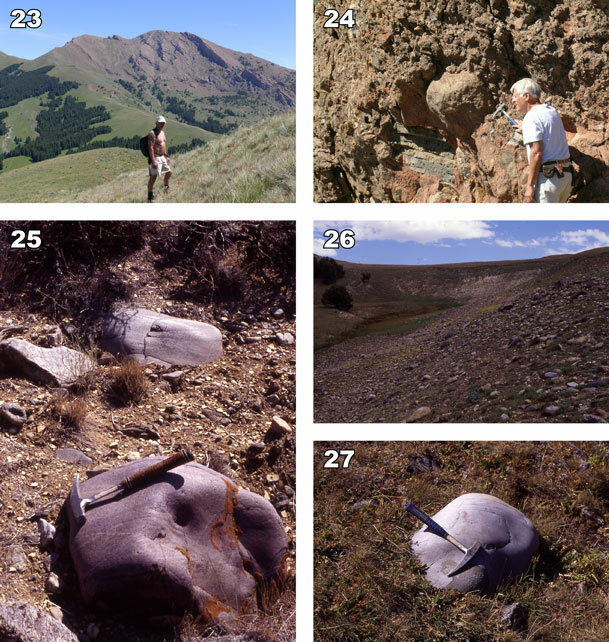 Steidtmann, J.R., Origin of the Pass Peak Formation and equivalent Early Eocene strata, Central Western Wyoming, Geological Society of American Bulletin 82:156–176, 1971. Return to text. Schmitt, J.G. and Steidtmann, J.R., Interior ramp-supported uplifts: implications for sediment provenance in foreland basins, Geological Society of American Bulletin 102, p. 495, 1990. Return to text. Dorr, Jr, J.A., Spearing, D.R. and Steidtmann, J.R., Deformation and Deposition between a Foreland Uplift and an Impinging Thrust Belt: Hoback Basin, Wyoming, Geological Society of American Special Paper 177, Boulder, CO, 1977. Return to text. Lindsey, ref. 72, pp. B52–B57. Return to text. Love, ref. 68, p. A28. Return to text. Kraus, M.J., Sedimentology and tectonic setting of early Tertiary quartzite conglomerates, northwest Wyoming; in: Koster, E.H. and Steel, R.J. (Eds. ), Sedimentology of Gravels and Conglomerates, Canadian Society of Petroleum Geologists Memoir No. 10, Calgary, Alberta, p. 207, 1984. Return to text. Kraus, ref. 80, pp. 209, 212. Return to text. Rohrer, W.L. and Leopold, E.B., Fenton Pass Formation (Pleistocene? ), Bighorn Basin, Wyoming, U.S. Geological Survey Professional Paper 475-C, pp. C45–C48, 1963. Return to text. Kraus, ref. 80, pp. 204–205. Return to text.